There used to be a lot of darkness in the world of Belgian craft chocolate. But then, suddenly, little lights popped up. And the pace at which new stars pop up is staggering. Today I present you a new name on this website. Cédric De Taeye – Torréfacteur chocolatier. I met Cédric De Taeye a couple of years ago as a member of the jury of the international chocolate awards Belgian round. We got talking about the chocolate scene and he told me he was setting up his own production. At the end of last year he officially launched his chocolate range. I was happy and honored to be invited for a private tour of his operation and a tasting of his bars. His atelier, located in Ellezelles, in the French speaking part of Belgium – rest firmly against a local craft brewery. I can’t think of a better place to set up a business. Most bean-to-bar chocolate makers I have met start at a very small scale. But not Cédric. He is clearly a man with a plan. His production site features some very nice chocolate making machines, from roaster up to an automated packing line. He has great ambition and wants to set bean-to-bar chocolate firmly on the map. Cédric De Taeye will not only be producing his own line of bars and chocolates, but intends to produce couverture for other chocolatiers as well. An example of this is a chocolate bar made by six hands – where he teams up with Pierre Marcolini and Jean-Philippe Darcis, renowned names in the Belgian chocolate world. His entire approach breathes professionalism from the very start on. As a bio engineer, Cédric has a firm foundation in the world of cocoa growing and chocolate making. He is very open minded and loves sharing his knowledge. As such, he introduced me to several interesting parts of chocolate making that otherwise remain unseen for someone just enjoying a chocolate bar. The biggest eye opener was being introduced to unroasted cocoa beans. I’ve tasted roasted beans before. But trying the unroasted version and comparing them to the roasted counterpart, let’s you appreciate the level detail chocolate makers put into roasting. One always reads how a chocolate maker wants to preserve as much as possible of the delicate flavors of cocoa in their end product. Eating an unroasted cocoa bean will show you exactly what they mean by that phrase. I was stunned by the beautiful flavors in well fermented, dried cocoa. When you find those same aroma’s in the roasted beans, you know that the roaster knows his art. This is exactly why Cédric has added Torréfacteur (roaster in French) to his name. It amplifies the first and most important step in chocolate making and shows that he as chocolate maker is far above any mass market supermarket product. Just holding the wrapped bar shows that this is in fact a well thought out product. The cardboard sleeve shows his logo, the origin, the bean variety, the cocoa percentage and the harvest year. Flip it over and the nutrition facts and ingredients are shown. No surprises here: cocoa beans, sugar and cocoa butter are the only three on the list. The cocoa percentage noted is special though. 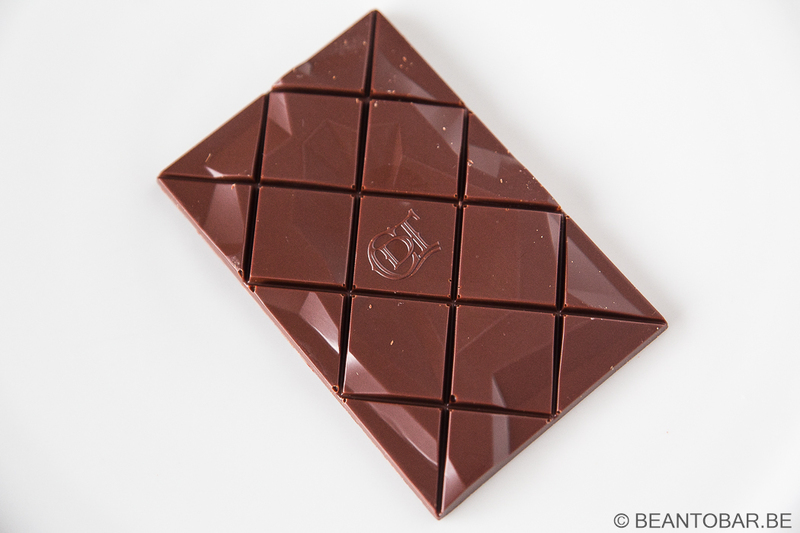 Cédric does only mention the percentage of cocoa beans used in the bar. He doesn’t include the added cocoa butter – as most chocolate makers do. As cocoa butter is a fairly taste-free product, this way of working assures the consumer can actually compare bars with the same cocoa bean quantities. So in fact, this 74% bar would be higher in percentage if Cédric followed this colleagues. Inside the sleeve, even more info is to be found. On the right a brief description of the steps of chocolate production. In the middle and right, info on the terroir and taste profile. The chocolate bar is protected by a cellophane blister, though his next batches will feature an air sealed foil. The bar is a thing of beauty. A custom made mold is used (always adds to the visual appeal of a bar). A checkered scoring with a relief make it look gorgeous. There are some slight air bubble imperfections, but those will probably disappear over time as Cédric produces more of his bars. You simply want to crack of a piece and dive into the flavors it offers. One can’t argue, the raw materials are of high quality. 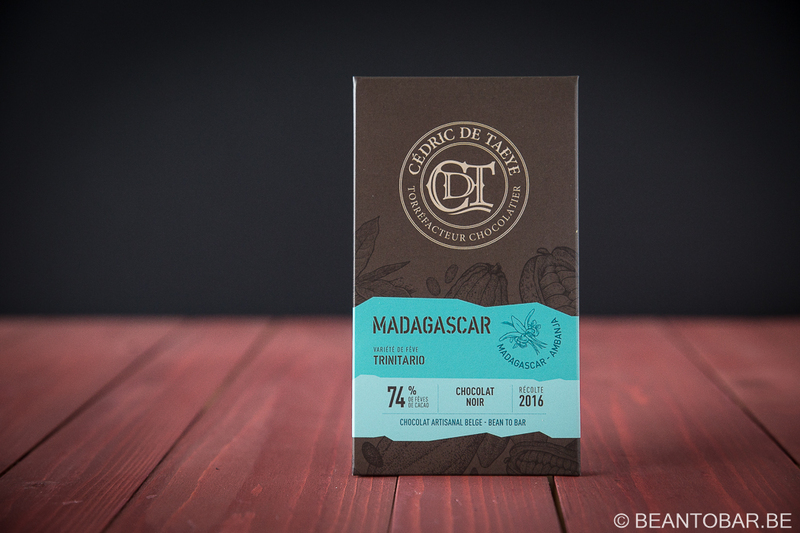 Taste: This chocolate shouts Madagascar form the moment you get it in the mouth. There is a short burst of roasted cocoa before a tsunami of red fruits thunders over the palate. There is red currant, raspberry and blood orange, carried by a masculine woody undertone. The flavor is fresh and vibrant, never overwhelming yet grabbing your attention. Soft cocoa notes intertwine with the endless stream of fruits. Near the end of the melt, refined tannins appear and make clear this is a higher percentage chocolate. When the actual chocolate has molten, the after flavor keeps rolling and now offers staggering amounts of roasted cocoa and chocolaty notes. The fruits are gone by now and makes way for a sweeter, rounder flavor of a vanilla note reminding me of a wine matured in American oak barrels. The after flavor never seems to stop. Bold and powerful, a chocolate to be savored slowly and with attention to the details it carries. Red is the color I associate with this bar. Cédric De Taeye certainly grabs my attention with this bar. He doesn’t try to tone down the lush flavors of the Madagascan beans, who might overwhelm people who are used to generic industrial chocolate. 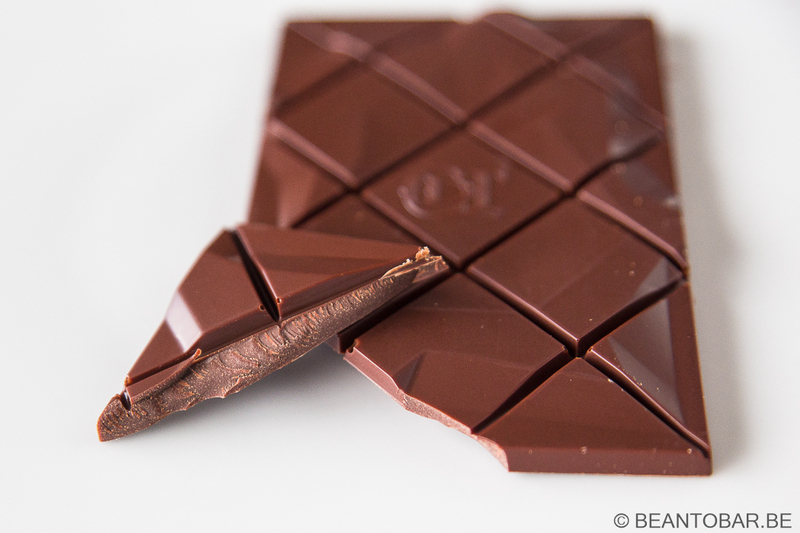 As Cédric states, there are other origins who offer a smoother transition from supermarket bars to fine chocolate. Madagascar is bold. Yet offers tremendous amounts of flavor. And every time I cross this origin, it makes me fall in love with real chocolate all over again. Especially if it has been in the hands of a talented creator. I can’t wait to sample the other bars I have received.